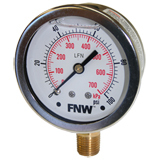 Liquid-filled pressure gauges provide users with a number of advantages in certain measurement applications. They are ideally suited for uses on equipment where excessive vibration and pulsation are encountered, such as pumps, compressors, and machine tools. Connection and wetted internal components meet Federal lead free requirements.